The Last Hunger Season – One Billion Hungry: Can We Feed the World? For the four featured farmers life is about to change. Immediately prior to when the book is set, Rasoa, Leonida, Francis and Zipporah signed up to the One Acre Fund Programme. This programme, set up by Andrew Youn in 2006, provides smallholder farmers in Kenya, Rwanda and Burundi with certified seeds, fertiliser and training, inputs that are paid for by the farmers during the course of the year. Basic in its model, its aim is transformational change, enabling farmers to work their way out of poverty and escape the hunger seasons that come each year. As the quote states it is about supporting farmers in reaching their dreams be they to send their children to a good school, build a greenhouse or start a local business. 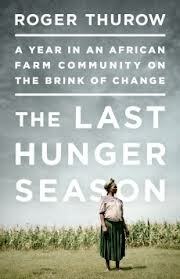 As with Roger Thurow’s previous book, Enough, co-authored with Scott Kilman, food and humanitarian aid, while being necessary in times of famine, should not be the predominant development model. Instead long-term agricultural assistance, research and innovation that allow farmers to become successful business men and women and to feed their own communities should be supported by donor countries as the best pathway to long-term freedom from hunger. The book is ultimately about hope. Hope that One Acre Fund can carry on and expand its work, hope that similar programmes will develop given sustained international funding and political will and hope that the four farmers carry on working towards their dreams, dreams that with the help of One Acre Fund are well within their reach. Roger Thurow will be appearing at the Hay Festival in Hay-on-Wye in Wales on May 26th 2013 and discussing his book with the Telegraph’s environmental editor Geoffrey Lean. He will also be involved in a panel discussion with Satish Kumar, editor of Resurgence and Ecologist, Elisha London from The Global Poverty Project director and Esther Mweso of Concern Worldwide. At this event, which is in association with the Enough Food for Everyone IF campaign, they will discuss tackling hunger with a view to the UK G8 summit in June.